Did you know that forensic scientists use STEM to outsmart criminals and solve crimes? Did you know that while minorities are over-represented in prisons and in criminal matters, they are under-represented in the forensic careers that influence those same criminal judgments and decisions. Has your child ever expressed interested in Science, Technology, Engineering or Mathematics (STEM)? If so, the Forensics Un-cut 1-day summer camp is perfect for them! 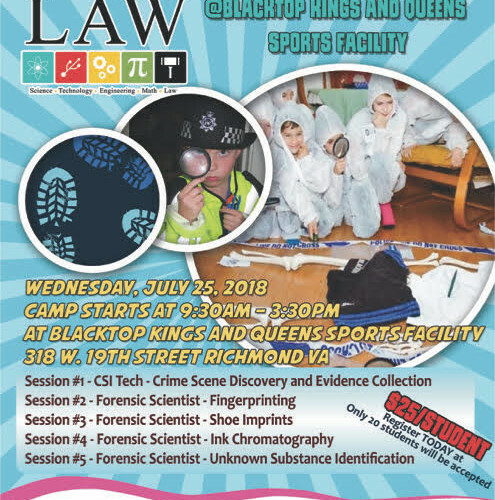 On Wednesday, July 25th from 9:30am – 3:30am at the BTKQs Sports Facility @318 W. 19th Street, Richmond VA, we have a great STEM Forensic Science 1-day Summer Camp for 20 youth (ages 8-14 year old). Students will explore a crime scene, learn about fingerprints, fiber analysis and participate in a mock trial to explore the STEM and forensic science careers found in the legal industry. Cost is only $25 and includes lunch. Register online at www.stemlaweducation.org or pay at the BTKQ summer camp drop off! The STEM-Law Education Initiative is a very unique approach to teaching kids about the Law using real-world solution-development, coupled with STEM exploration.